See the Otaru Canal covered in snow. Sample tasty sweets and local wine, then stroll through Shiroi Koibito Park all lit up on this full-day tour from Sapporo. Ideal for couples and families. See some of Hokkaido's most lovely locations, decorated with a blanket of white snow, on a convenient tour. Visit Shiroi Koibito Park, where the smell of chocolate and sweets fill the air and the Western-style buildings are lit up after dark. Explore the Kitaichi Glass Factory or Venetian Art Museum, and sample local cookies and cakes at sweets shops along the romantic Otaru Canal. Warm up with whiskey from the Nikka Distillery before heading back to Sapporo. Stroll by the retro canal lined with Victorian street lamps. Find beautiful and colorful Otaru-style glassware. Explore the charming museum inspired by a Venetian palace. Try the delicious Baumkuchen cake, a specialty of Otaru! Visit the distillery of this whiskey brand founded in in the early 20th century. Enjoy the historic buildings as well as the samples of Nikka's famous drink. This theme park is based on the Shiroi Koibito cookies, Hokkaido's most famous souvenir. Besides sampling some of these white chocolate creations, you can enjoy the European-style buildings made even more charming with Christmas decor. After exiting the South Exit of the JR Sapporo Station, you will see a white building (ESTA building) on your left hand side. Proceed to the area with taxis. You will find stairs leading up to the second floor. 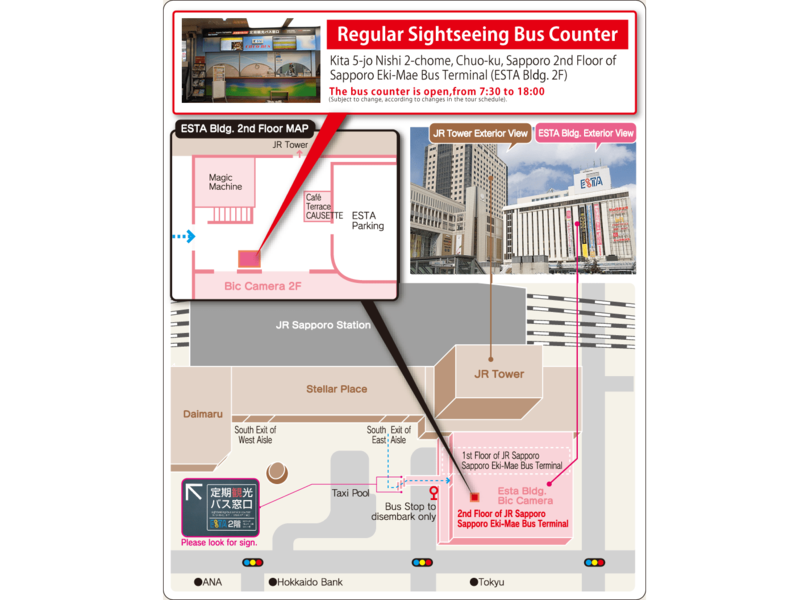 Please check in the bus counter with the light blue sign. Please arrive at the check-in counter with your printed VELTRA voucher at least 15 minutes before the tour departure time. For children under the age of 6 who require a seat, please book as 'Child 6-11'. Guests will receive a 10 % discount ticket for meals, seafood, produce and crafts, and a 5% snack discount ticket for Kita no Ryoba (Otaru Canal Branch and Otaru 5 Branch), excluding drinks, alcohol, shipping, and isothermal packaging. Meals and drinks are not included in the tour fare. You may take lunch on your own during your stay in Otaru. At Kita no Ryoba, there are special dishes for those taking part on this tour for purchase. Arrival times may be earlier than scheduled due to holiday breaks or facility rules. the return bus to Sapporo Station may be delayed. Please allow enough time to make connecting transfers. Tours may be cancelled due to natural disasters and road closure due to marathon races etc. Please contact us and check the situation with the tour in the event of poor weather conditions. The duration of sightseeing may be changed due to traffic and the number of passengers. Shiroi Koibito Park will be lit up in March as well, but due to the time of the sunset, the light-up may not be visible on certain days. Any cancellations made between the booking confirmation date to 2 hours prior to the activity start time will be subject to a charge of JPY 100 per participant.